Three Rock Mountain, which forms part of the group of hills in the Dublin Mountains. Seaside villages, mountains and castles. There’s more to Dublin than its famed city. I thought I knew Dublin. I’ve spent lots of time in the capital and even accompanied friends from other countries on trips to tourist sites such as Trinity College and the Guinness Storehouse. Surely I’d seen all there was to see of Dublin’s fair city? On a recent trip, I realized how wrong I was. By confining myself to the delights of the city center and ignoring areas north and south of the River Liffey, all I’d done was skim the surface. The Irish Tourist Board is currently running a publicity campaign which boasts that Dublin represents “a breath of fresh air.” What they mean is that it is more than its city center. As I was to discover, Dublin is also its seaside villages, its nearby mountains and its countless unexpected surprises. The first of these is Howth, an old fishing village eight miles north of the city. 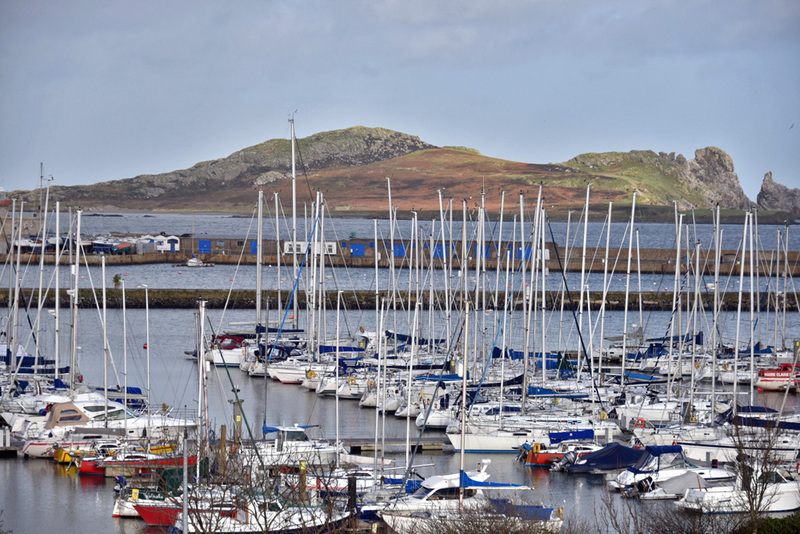 A former Viking stronghold, the Howth of today combines the ramshackle charm of the working fishing port with an elegant yacht club and upmarket eateries. I was shown around by Pat Liddy, one of Ireland’s most entertaining tour guides. 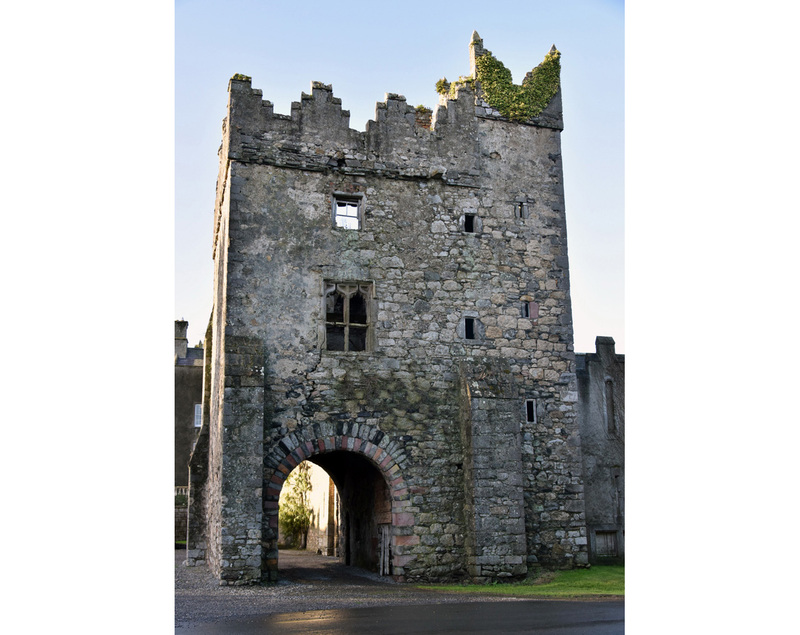 We started at Howth Castle, which dates from the 14th century and is still inhabited by descendants of the original Lord of Howth. A small section of Howth Castle which dates to medieval times and has been the home of the Gaisford-St. Lawrence family for over 800 years. Funnily enough, they do that while keeping the castle itself closed to visitors except on Sundays during August and September. However, its higgledy-piggledy grounds are well worth a wander. You’ll find the National Transport Museum in one corner, a cookery school in another, and a golf course in yet another. 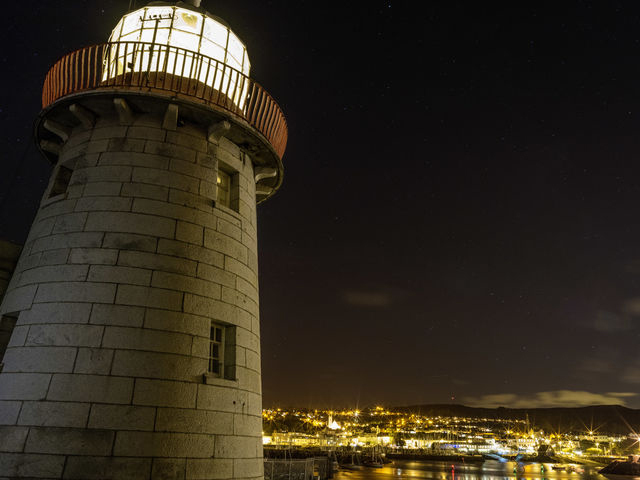 From the castle, we ambled along to the Cliff Path, a looped walk that starts and finishes in the village and culminates in a viewing point that takes in Howth, its lighthouse, Ireland’s Eye just off the coast and Dublin City in the distance. A walk along the cliff path in Howth. Back in the village, Pat told me about the gun-running that happened in Howth prior to the 1916 Rising. When the Ulster Volunteers imported arms in 1914, the Irish Volunteers decided to do likewise. A group comprising of Erskine and Molly Childers, Roger Casement, Alice Green, and Mary Spring Rice, arranged for guns to be brought to Howth in the Childers’ private yacht, the Asgard. Molly and Erskine and a crew of five others sailed the yacht to the Belgian coast where they picked up 900 rifles that had come from Hamburg and brought them back to Howth, where they unloaded them on the 26th of July. Molly kept a diary of all that happened on that journey – a diary now viewed as an important historical document and kept in Trinity College’s archive – and the guns went on to be used in the Easter Rising. Howth Harbor Lighthouse, built in 1817, is located at the end of Howth Harbor. Pat pointed out where King George IV landed in 1821. Dublin had been suffering economically since the Act of Union in 1800 and this royal visit was seen as a hopeful indicator for the future. So hopeful were the people of the city that they festooned Dublin with banners, flags, and bunting. On Howth Pier itself, locals went so far as to mark the exact spot where King George’s feet made contact with the pier and a stone mason then chiselled his footprints into the granite for posterity. After strolling along the harbor, Pat and I sat by the pier enjoying some of the best seafood Dublin has to offer in Deep Restaurant. We cast our eyes enviously over the luxurious yachts berthed in the yacht club and giggled as seals tried to steal fish from fishermen on the working side of the harbor. Sailing boats in the harbor of Howth Peninsula. After lunch, I traveled further north to Malahide, which is another seaside town with a castle at its heart. The perfectly-preserved Malahide Castle was occupied by the Talbot family for 800 years up to 1975. At the entrance, there’s a portrait of the last Talbots who lived here. There’s Lord Milo who died in 1973 and his sister Rose who sold the castle to Dublin City Council in 1976. The castle stands as testament to the life that they, and their ancestors, lived. The impressive oak room has walls that are inlaid with carved oak panels that are more than 500 years old. The drawing room is painted in a shade that was created especially for it and is to this day known as Malahide Orange. I was most struck by the family bedrooms. They are furnished with children’s toys, dressing tables, wash stands, and personal items that make the era come truly alive. I loved the gardens, too. Lord Milo was a keen botanist who traveled the world collecting specimens. The gardens are his living legacy. 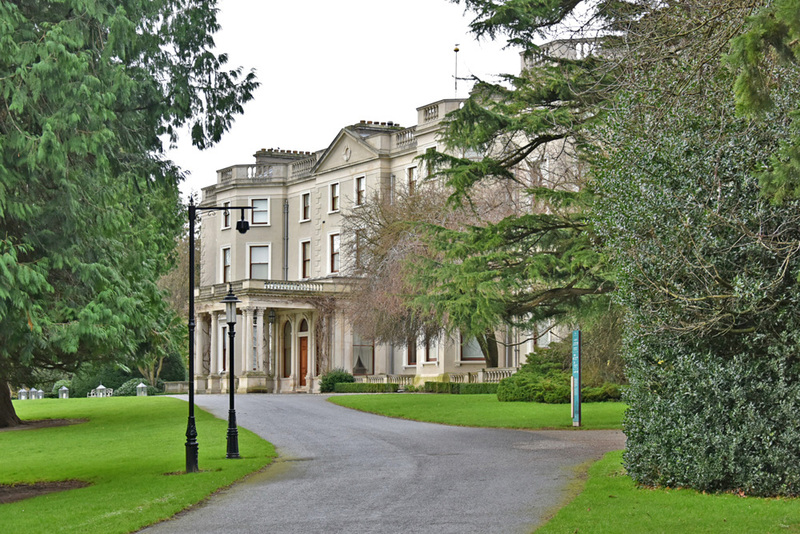 Farmleigh, the official Irish State guest house. It was formerly one of the Dublin residences of the Guinness family. The following day, I traveled east of the city center to Dublin’s Phoenix Park, the largest city park in Western Europe. There, I visited Farmleigh House. For two hundred years, this was one of the homes of the Guinness family, but in 1999, it was bought by the Irish government who set about establishing it as Ireland’s official guest house. It’s now where heads of state stay when they visit the country. The public can take guided tours whenever the house is not in use. These tours take in the dining room, which is laid with official State-branded crockery. Then there’s the library, which is home to some of Ireland’s most valuable first-edition books. The ballroom is a marvel with its elaborate plasterwork, chandeliers and oak floor that is said to be made from disused barrels from the Guinness brewery. So too, is the conservatory, with its marble floor, Victorian glazing, and exotic plants. The grounds at Farmleigh are also worth exploring. There’s a fountain, a sunken garden, a walled garden, a boathouse and a café. You may even spot some of the wild deer that roam freely in Phoenix Park. 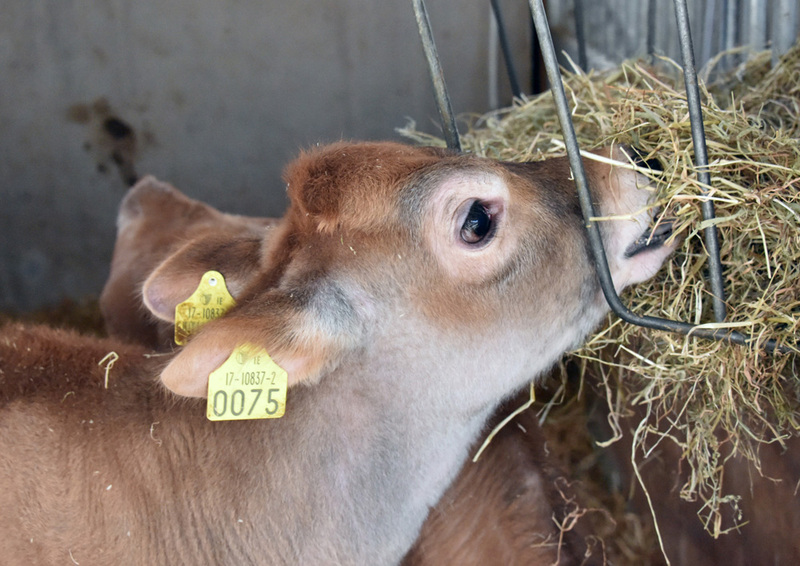 A calf on Airfield Estate, a working farm which is open to the public all year round. Later, I continued south to Airfield, a place that offers another fresh perspective on Dublin. It’s a 38-acre estate that was bought by a Dublin family called the Overends in 1894. Three daughters were born to this family, but one died as a young child after contracting tuberculosis from unpasteurized milk. That tragedy defined the lives of her surviving sisters. They went on to turn Airfield into a city farm and to devote themselves to pushing for improvements in food and farming in Ireland. You’ll learn all about these eccentric sisters as you roam through their home and farm. You’ll hear how they went to buy a car for use around the farm and come home with the latest Rolls Royce instead. That car is still on the farm and it’s the only known Rolls Royce in the world to have been fitted with a tow bar, to which the ladies would attach trailers of Jersey cows to bring to agricultural shows around the country. 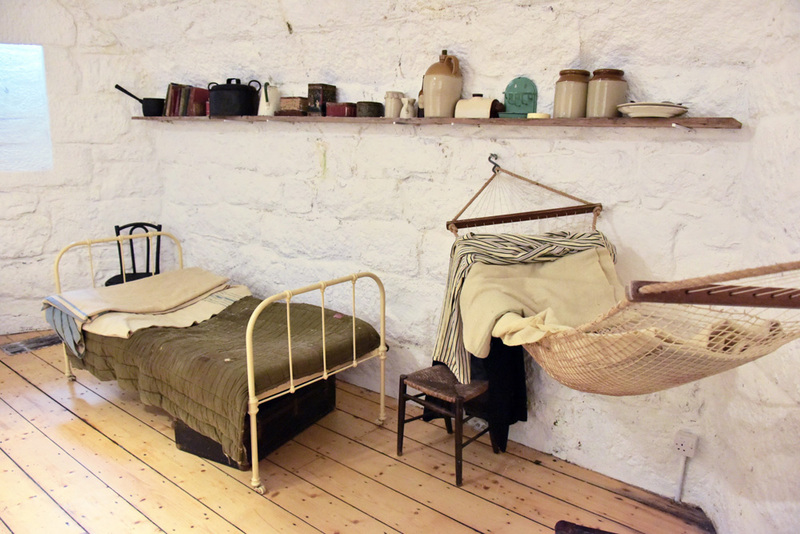 You’ll see the pasteurization parlor the sisters installed at Airfield, which was the first of its kind in Ireland. And you’ll be told how even though they are now dead, the staff of this city farm are determined that the sisters’ legacy will live on. Airfield now offers visitors an opportunity to learn about food and farming. Everywhere I went, children were being shown how to feed and look after animals. I even saw some excitedly collecting freshly-laid eggs and bringing them into the kitchens where they made scrambled eggs and toast. From Airfield, I continued south to Sandycove, home to Dublin’s famous Forty Foot swimming spot. Although, I visited in winter, there were still people swimming in the cold, grey Irish Sea. Everyone is welcome to dive in and on that day, some visiting French tourists joined Dubliners in stripping down to their togs and taking to the sea. Sutton Martello Tower at sunset. There’s a Martello tower right beside the Forty Foot. 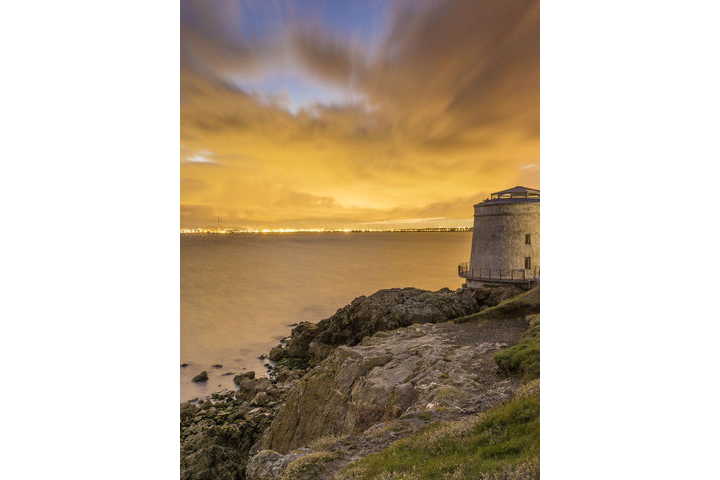 The coast of Dublin is lined with these towers, which were erected during the Napoleonic Wars, each within sight of the other so that they could signal in the event of an attack. Round and squat, they have been put to various uses over the years. The one at Sandycove was occupied by a friend of James Joyce’s in the early 1900s. Joyce stayed there and it is said that he wrote the first part of Ulysses in the tower. Today, the tower is a museum that is run entirely by volunteers. These enthusiasts have assembled a treasure trove of Joyce’s letters, books, photos and first editions. They even have one of his death masks. A section of the tower has also been kept as it was when Joyce stayed there. Anyone who considers themselves a fan should visit. James Joyce Tower bed and hammock. My final day in Dublin was spent in the Dublin Mountains with Liz McEvoy, the walking tour guide who runs Trails and Tales. A mere ten miles from the city center, Liz led me through unspoiled countryside, regaling me with stories along the way. One of our walks was in the Glenasmole Valley (which comes from the Irish for “valley of the thrushes”). 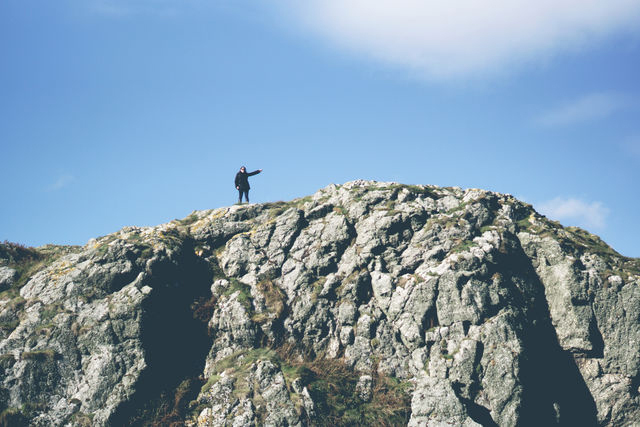 “Fionn Mac Cumhaill and the Fianna roamed this area in mythological times and Fionn himself is said to have given the valley its name,” said Liz. As we walked, Liz pointed out 5000-year-old passage tombs. She told me how the reservoir in the middle of the valley was built during the Famine and that everyone in the valley was involved in building it. So much so that many had to go back to school once the building work was done in order to learn to read and write. “We have records of men in their 40s starting primary school,” she said. 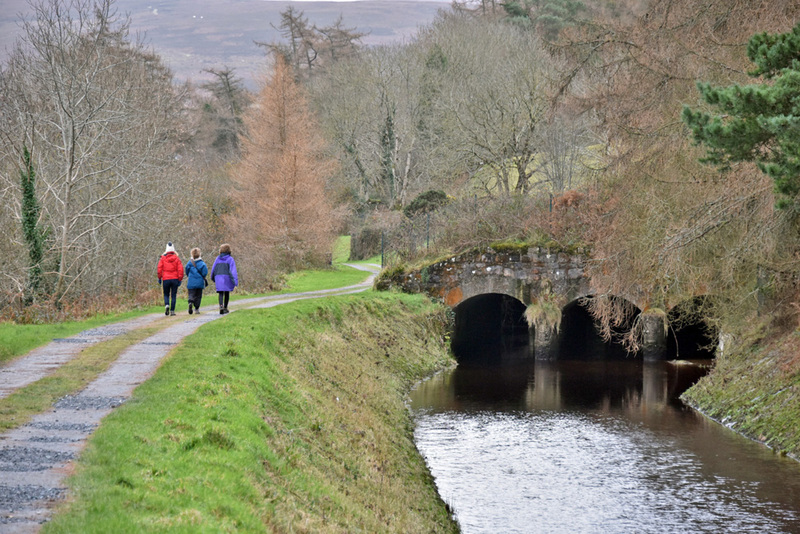 Walking in the Dublin Mountains with Liz McEvoy who runs Trails and Tales. Liz’s family have lived in the area since the 1600s so she has personal stories to tell too. She tells one of an uncle who had the same name as Michael Collins. “The Black and Tans would arrive at the family home during the War of Independence and the poor man would have to convince them that he wasn’t the Michael Collins they were searching for,” she laughed. Would you be interested in taking groups of tourists on one of your tours ?